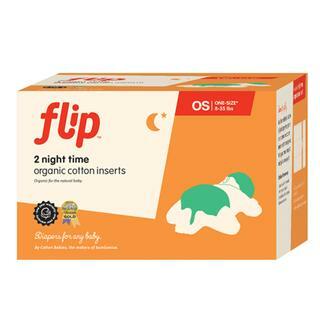 Flip Organic Cotton Night Time Inserts - a pack of two. An absorbent organic cotton insert for Flip nappy covers but can be used as an insert for other systems. Flipä‹¢ Organic Inserts are very soft, ultra-absorbent and made from 100% Oeko-Tex¨ certified organic cotton. Simply fold one way for the small setting and fold the other for a medium/large setting. Flipä‹¢ Organic Inserts are ideal for a heavy wetting baby overnight. 1.Choose the best insert for your needs: stay dry or organic. 2.Toss the used insert in your nappy bucket or wet bag. We recommend using two inserts with a toddler or heavy wetter overnight. Extra inserts sold separately. * 2 Flip Night Time Organic Cotton Inserts (Cover sold separately). * Created as an option for heavy wetters or overnight. Flip Night Time Inserts are very absorbent and recommended for all occasions whether travelling, out for fun times at the park or simply need a little extra for your very active toddler.